Chocolate – or should we say cocoa beans, have been used for hundreds of thousands of years. In fact, in ancient civilisations in South America and Mexico, the humble cocoa bean was actually a form of currency. Cocoa trees grew in the plentiful shade of the forests, but over time, natives started moving these plants into their villages so they could grow their own. They could literally grow money on trees! Cocoa beans were also used to make drinks. Having been fermented and roasted, the beans were then ground into a paste. After mixed with spices, water and often oatmeal, the drink became a popular treat that was enjoyed by society’s elite. And due to the drink being made solely from cocoa beans, it offered a plethora of benefits, including an improved mood, better stamina and higher endurance. Montezuma even used it as an aphrodisiac. Europeans were behind the times when it came to chocolate, as they didn’t discover it until the 16th century after explorers ventured to the parts of the world where cocoa beans were common. To start with, the much-loved cocoa drink was a little too bitter for the Europeans. However, they were quick to notice just how effective these beans were, and how they were such a rich part of the natives’ culture. Bringing these beans back to Europe, they used sweeteners (e.g. honey) to try and improve the taste of the drink. Then, when sugar was imported, this became the common component within chocolate-flavoured drinks. 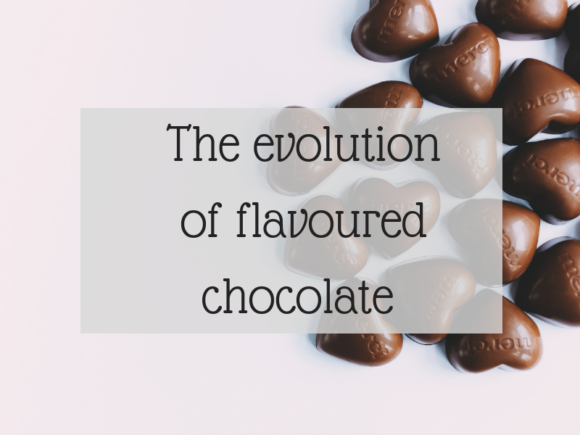 The first flavoured chocolate was born! And so the Europeans continued to experiment with chocolate, discovering how to remove the cocoa butter from the mixture, so they were left with a powder. Then, they started to mix the powder with various other liquids to try and further improve the cocoa drink. The cocoa butter wasn’t left to waste, though. Yep, you guessed it – this was moulded to create the wondrous chocolate bar. This took place over 200 years ago, and since then we’ve continued to introduce new flavours and ingredients to chocolate to further evolve it. From candy-popping designs that are a firm favourite of Willy Wonka’s, to strawberry-flavoured treats that are a must-have for many, the humble cocoa bean has travelled a long way over the years.